Northern Ireland boss Michael O'Neill talking tactics in Baku with assistant coach Austin MacPhee. Pic by Pacemaker. Michael O’Neill will not focus Northern Ireland’s gameplan around stopping Azerbaijan debutant Richard Almeida tonight - admitting “the best Brazilians don’t always play in Azerbaijan”. Azeris boss Robert Prosinecki could unleash Brazilian-born Qarabag playmaker Almeida for the first time after his naturalisation to represent his adopted country was approved by FIFA last week under the five-year residency rule. 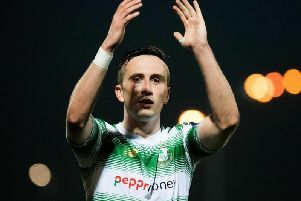 There is understandably plenty of buzz about Almeida’s expected bow at the Tofiq Bahramov Stadium among the locals, yet O’Neill countered by stating his midfield trio of Steven Davis, Oliver Norwood and Chris Brunt will have seen foes of great ability plenty of times in the English domestic leagues. “Regarding Richard Almeida, we have watched him play for his club, we know this will be his first game for Azerbaijan and we respect his quality as a player,” O’Neill said. “But he will play against three midfielder players who play in the English Premier League so they play against Brazilians, Argentinians, Spanish, Italians. Azerbaijan were unbeaten in their World Cup qualification campaign when facing Northern Ireland in Belfast last November and shipped four that night at Windsor Park to surrender second place. And a 4-1 loss to Germany in March has left them behind the world champions, this weekend’s opponents and the Czech Republic. That scenario in the group is why O’Neill perceives Saturday’s contest as one which has more riding on it for the hosts. “I’m confident that having looked back at the game in Belfast, we certainly know the areas where we can exploit,” the Northern Ireland boss said. “We scored four very good goals against Azerbaijan in Belfast against a team that hadn’t been beaten. We come into this game in a good place, the team is in a good place. Northern Ireland may have made history when participating at their first ever European Championship finals last summer, but progressing to the 2018 World Cup in Russia would be even sweeter for Josh Magennis. “It would be a harder way of getting there, no doubt about that,” said Magennis. “To get (to the World Cup) you would have to play unbelievably well in the group stages and then even better in the play-offs. “In that sense, I wouldn’t say it would be better, but it would certainly leave a sweeter taste in your mouth that you have gone through so many games and you have still managed to get there.